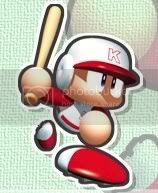 RPG adds Rally hitter you have to play this a lot to fill up the Rally hitter bar. The other three don't do anything. Not sure why but they don't. *In a whisper* "If you release it they will buy it." Actually I think that the video games do differ in price. Yep, they do. Puzzle is $400, RPG is $500, and Action is $100. Anyone know when the items in the store change? Every paycheck (25th)? Last edited by Soccer55 on Wed Sep 03, 2008 11:04 pm, edited 1 time in total. That might be a good idea to try. I thought that it changed by every "level" you gain. I know for sure that as your (ex: golf) level increases, you can buy better golf clubs. Items in the shop appear to change on the 25th. That's all I have for now. Last edited by Soccer55 on Sun Sep 07, 2008 5:30 pm, edited 1 time in total. Sports and Adventure gave a boost in the ability: Tough Out. keep it up guys, I'll find a moment to compile this sometime... RL has tossed a girl into my life (woman = time x money) so I won't be as pervasive as I usually am here. I saw that there were no wiki pages for Darts and Video games under My Life -> Free Time -> Hobbies, so I created these pages with all of the information that I was able to gather. I'm rather new to wiki editing, so if the pages could be formatted better, by all means change it. I have tough out so thats probably why I don't see that show up when I play those games. Last edited by Cub of the Ray on Wed Mar 04, 2009 3:06 am, edited 3 times in total. anybody know what the garlic supplement does, exactly? I'm thinking it speeds up the condition cycle somewhat but I aint 100% sure on that. He's a real player that DrMario made for me. This is my friend's forum from school. http://jplaz.com/ I'm catcher51 there, too. R.I.P. Harry Kalas 1936-2009 "It's outta here!" "I'm a dishonest man, and a dishonest man you can always trust to be dishonest. Honestly. It's the honest ones you have to watch out for. Because you never know when they're going to do something stupid." Jack Sparrow. Pirates of the Caribbean and the Curse of the Black Pearl.